Jumbo Sushi is located on No.3 Road, in a Plaza near the vicinity of Richmond Centre.I was originally going to Sakura Sushi for lunch (my ALL time favourite sushi place in Richmond) , but they were closed for the long weekend. 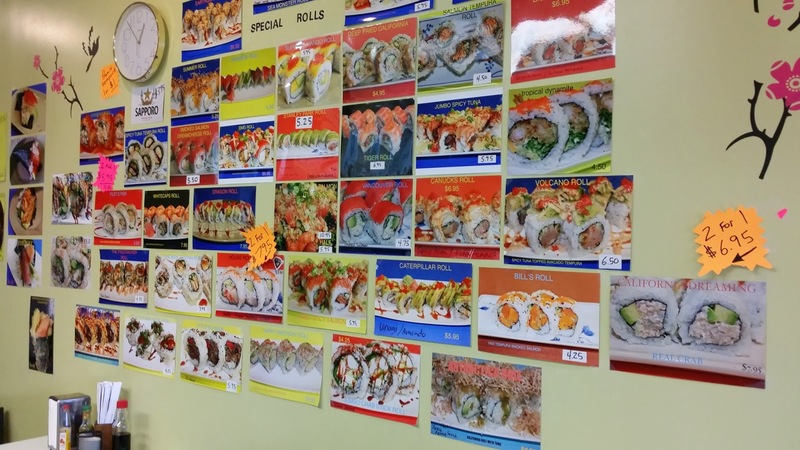 So I looked up Sushi places and Jumbo Sushi looked promising. 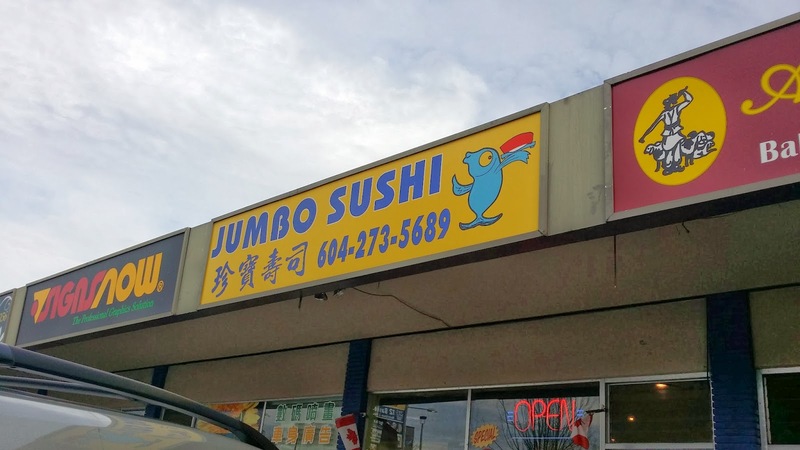 Jumbo Sushi is actually on the other side of the plaza from Sakura Sushi. 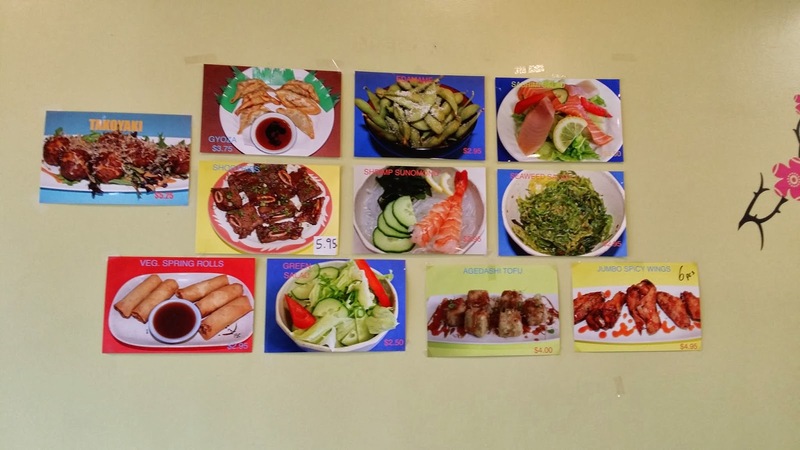 The restaurant is small, with the pictures of their items plastered all over the walls. I like how the menu is visual, as it helps amateur sushi-goers (yes, I just made up that word haha) who have no clue what sushi names mean. 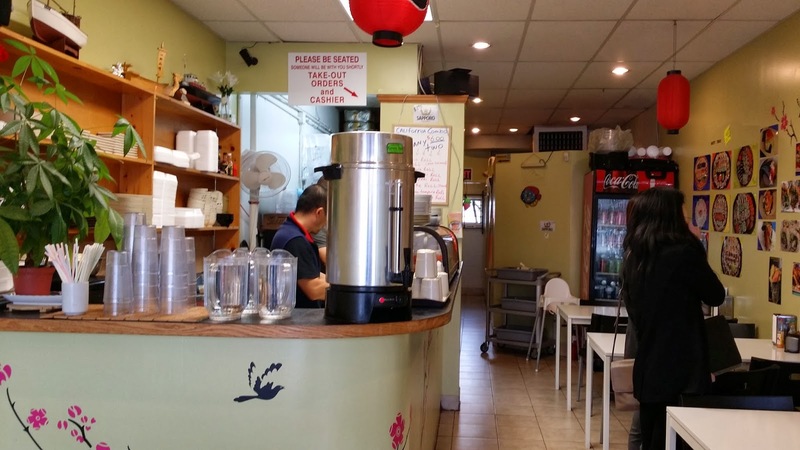 The amenities are basic, with one chef working behind the counter. I like how their menu is visually laid out, so you can see exactly how the rolls look like. 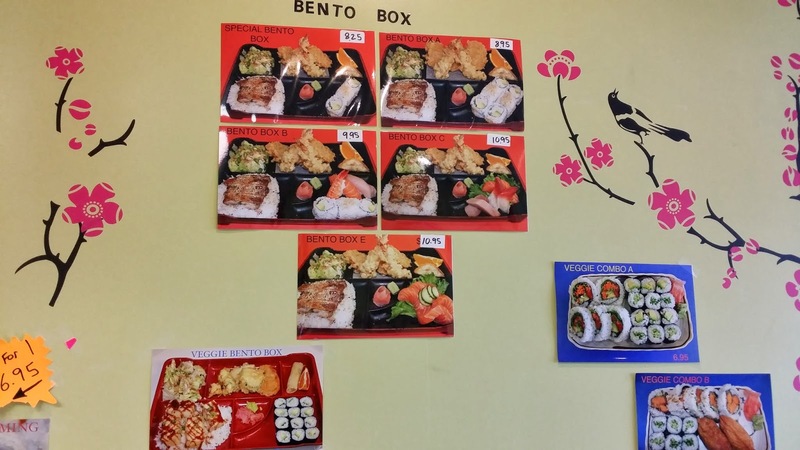 Their Bento Boxes, which are all pretty much the same. The sushi looked delicious in the box, however I hate to say this but...I was EXTREMELY, yes, extremely, disappointed. The portion sizes were large, but the taste...THE TASTE! 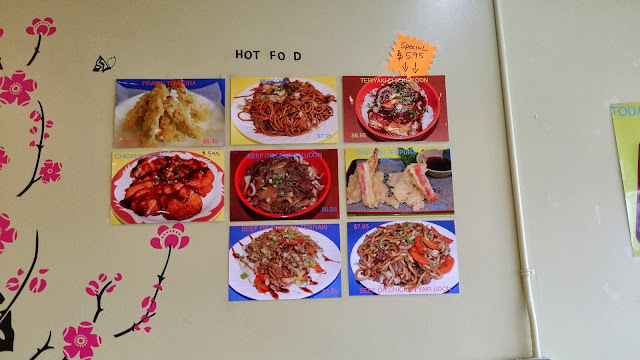 It tasted so bland and flavourless. The texture of the tempura in the Dynamite Roll was too mushy, tasteless and the greens were limpy. To make matters worse, the roll fell apart immediately. Another blogger mentioned that the rice tasted like the rice you would find in a Chinese restaurant, and boy, was he right! It didn't taste like the rice in sushi. It was bland, it didn't have that distinct sushi rice flavour. Maybe it's just because I've been spoiled by authentic Japanese sushi, but this sushi was downright AWFUL. 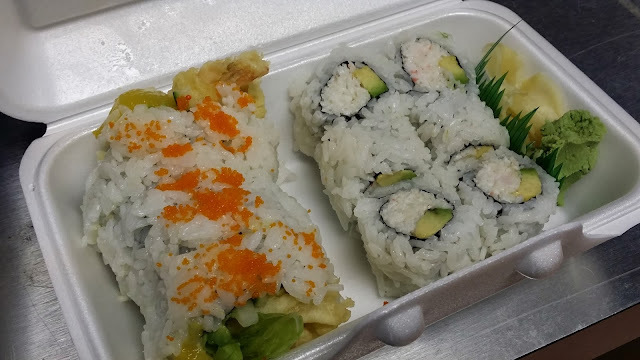 The california roll was just as disappointing as it didn't taste fresh, and the imitation crab tasted "off." Although it looked appetizing in the container, these rolls were a miss for me. I was shocked by the tempura. It texture wasn't even reminiscent of tempura! 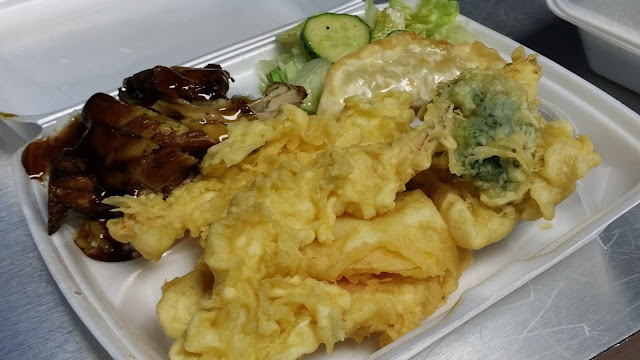 They clearly didn't use proper tempura batter, as it lacked the distinct bubbles that make up the outer shell of the tempura. To make matters worse, the tempura was cold, soggy and TASTELESS. Tempura should be crunchy and warm, not cold and soggy! I questioned if I was actually eating tempura. The quality was unacceptable. The meat was the only thing I could stomach. The soy sauce on the beef was alright, and tasted decent. The outer shell was crunchy, but the meat was again, cold. It also came with a side of gyoza, which tasted like frozen super market gyoza. I wasn't impressed. The sauce on the salad tasted like a random concoction of sauces, even worse than the salad at an all you can eat sushi place! I usually love Japanese salad, but this was by far the worse interpretation of it I had ever had.